What happens when you cross a legless man with too much alcohol and a flight on EasyJet? Answer: a diversion. I try to resist writing about these sorts of stories, but this one I cannot help but to poke fun at. An EasyJet flight from Manchester to Marrakech diverted to Lisbon when a drunk (aka, “legless”) man attacked a cabin crewmember…twice. Fellow passengers allege that the man had been drinking in Manchester prior to boarding. Onboard, the man — who won friends though his jovial manner despite being legless — was treated to several rounds of drinks. The legless man became combative, uttering racial slurs towards other passengers. A FA interceded, but the man grabbed the FA by the neck twice in a stranglehold. Although the flight was only an hour from Marrakech, the pilot opted to divert to Lisbon. 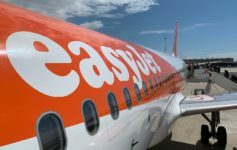 The diversion delayed over 200 passengers, some of whom were bussed for over an hour to hotel rooms in the Lisbon area (provided by EasyJet). Food and drink vouchers were also provided. EasyJet Offers Me 9EUR For Six-Hour Delay! Let’s all fly dry airline!!! British English: legless = drunk, wasted, smashed, hammered (you get the idea). But most likely still in possession of two legs. I’m not at all surprised. This is one of many recent articles coming out of Manchester with booze-related incidents. I’m from Gtr Manchester and it is not uncommon for Brits to get to the airport hours in advance of a flight and drink themselves stupid. It seems to be very much a cultural norm to be “on your way” by the time the plane leaves the tarmac. With bars open in the early hours, you can often see people smashing back pints at 2am, 3am through 6am, in anticipation of their holiday. It doesn’t seem to matter what time of day it is. I don’t begrudge people drinking ahead of flights, or onboard – I love a couple of wines myself – but UK drinking culture is embarrassingly excessive and it seems a lot of people have no self-control or care. Hopefully the UK gets their act together. It is never pleasant flying with wasted passengers, especially when it ends up with the flight being diverted, as was the case in this instance.